The vibrant colours and Dr Seuss qualities of Attila and Michele Kapitany’s succulent garden was an incredible backdrop for OGV’s official 2016/17 season launch on 27 August. And yes, there was cake! At least 800 visitors including families and volunteers came to explore the garden with cameras at the ready to capture the startling colours of glowing aloe species, ‘rivers’ of ground covering succulents and intriguing winding paths revealing rock sculptures and other quirky garden art that make this garden like no other. Vibrant aloes were at peak flowering time. Although the lead-up had been wet, the open weekend was blessed with dry weather all weekend and pockets of late-winter sunshine that made the hot reds, oranges and yellows really ‘pop’ in the garden. Quirky rock sculptures intrigued visitors. The garden inspired dozens of visitors to add to their own succulent collections or start a potted succulent project with the myriad of succulent ‘pups’ and plants available for sale. It was particularly lovely to see children carefully picking plates full of their favourite plants and to see the next generation of gardeners in the making. Michele Kapitany shared her wealth of knowledge at the succulent plant stall. Visitors on Saturday gathered to hear OGV Chair Liz Fazio and garden media personality Stephen Ryan speak about the importance of opening private gardens to the public and declare the new OGV season officially ‘open’. Stephen Ryan declares OGV's 2016/17 open garden season officially 'open'. Attila and Michele Kapitany far left. 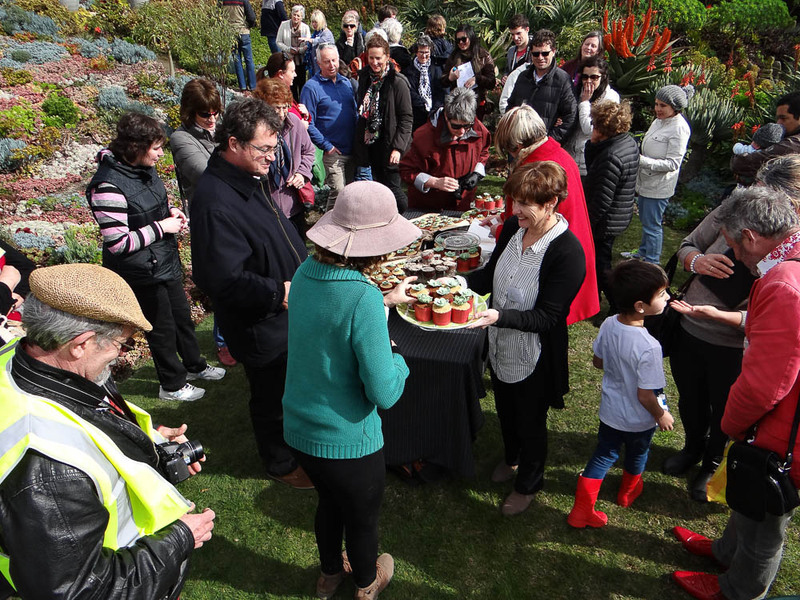 The launch also marked the first birthday for Open Gardens Victoria – and it wouldn’t have been a birthday without cake, or rather, cakes! OGV was very grateful to have the most cleverly decorated mini-potted succulent cup cakes personally hand made by talented cook and OGV Friends Group member, Kerrie Maloney. Cake or pot plant? Clever decorating by OGV Friend Kerrie Maloney, kept people guessing! The chocolate and caramel cakes were a massive hit and OGV is pleased to be able to share Kerrie’s sought-after cup cake recipe below. Kerrie has published detailed information on how to create the succulent icing toppers on her personal blog – click here. She has also posted a blog entry with photos and her own thoughts about the Kapitany’s unique garden. Big thanks to Attila and Michele Kapitany, Stephen Ryan, volunteers from the Cactus and Succulent Society of Australia and OGV, and everyone who visited for making this first open garden weekend so special. We look forward to seeing you at more of OGV’s upcoming open gardens this spring! Place water, chocolate and butter in a large saucepan over low heat and stir until smooth. Remove from heat and add castor sugar. Stir to combine and help sugar start to dissolve. Allow the mixture to cool slightly (about 10 minutes). Place the mixture in an electric mixer bowl. Sift flour with bicarb soda. Add to chocolate mixture and beat well. Add the egg and vanilla and beat until smooth. Place the mixture into cup cake cases or prepared cake tins and bake until a skewer inserted in the centre comes out clean. Approximately 40 minutes for the cupcakes and longer for cakes depending on the size of the tin. Allow to cool in tin on a wire rack. Melt chocolate on medium heat in microwave or on low heat in small saucepan. Add sour cream and whisk. Return the chocolate mixture to the refrigerator and allow to cool. The mixture will become thicker. Beat with electric beaters until thick and glossy. Spread or pipe onto cakes.